Kerala PSC announced Official Secretariat Assistant Exam 2018, which is going to be conducted on 13 Oct 2018. Syllabus for Kerala PSC Secretariat Assistant Exam 2018 is mostly same as the Company Board Assistant Exam syllabus. 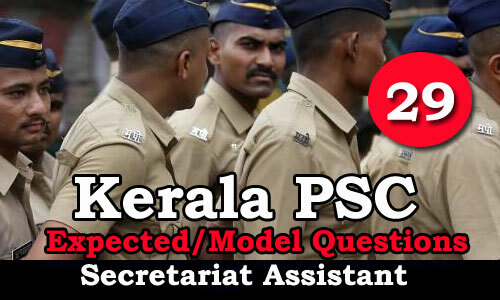 Kerala PSC Secretariat Assistant Model Questions are given in the links below. Secretariat Assistant 2018 Model Question will help you to prepare for the Exam. These question are prepared from Previous Kerala PSC Secretariat Assistant Question papers. 1. National highway that passes through Palakkad Gap? 3. Percentage of low land region occupying the total area of Kerala? 5. Average rainfall in Kerala? 6. Kerala receives maximum rainfalls in the month of? 7. The region known as Chirapunchi of Kerala? 8. The rain shadow region in Kerala? 10. The region where black soil is found in Kerala? 11. Kerala soil museum situated in? 12. The place in Kerala where the deposit of Ilmenite Monozite and Silicon are? 15. Number of rivers flow more than 100km in Kerala? 18. The District through which periyar river flows? 19. Chenkulam hydroelectric project is located in? 20. Ponnanipuzha is other wise known as?